Interracial couples sometimes feel like they don’t have any representation in the media. But there are series that feature couples of different races. Here are a few of the best. This Marvel series focuses on the titular character Jessica Jones. A private investigator with super strength, she’s recovering after being in a very abusive relationship with a mind-controller called Kilgrave. Despite the fact that she finds it hard to trust men and be in a relationship after her experience, she opens up to Luke Cage, who just happens to be another person with superpowers. This story of a black man and white woman romance shows how a relationship can be mutually healing after both people involved went through rough experiences. While the white woman black man relationship isn’t a focus of this series, it is certainly a big part of it. The story follows June, who has been renamed Offred, in a dystopian society where women are oppressed and reduced to their ability to bear children. It tells the heartbreaking story of how she is torn away from her husband and child and forced to have children for other couples. It’s a must-watch that explores the complicated ideas of oppression and freedom. Aziz Ansari, of Parks and Rec fame, is an Indian man who was sick of Indian men not being portrayed as desirable in media. He created and stars in this show that features him dating various women of different races, showing that Indian men get around just as much as any other guy out there. This comedic show has a very dramatic premise that makes it sound too dark to be funny. After being kept captive by a cult leader for fifteen years, Kimmy has to try and make a life for herself in New York after being rescued. She soon meets Dong Nguyen, an undocumented Vietnamese immigrant, who develops a romance with. The show addresses racial stereotypes with humor and shows that romance is possible even under the weirdest of circumstances. Not only does the show address interracial romance, but it’s also one of the funniest shows on air right now. This show features two great interracial couples. Firstly there’s the romance between Jake Peralta and Amy Santiago. 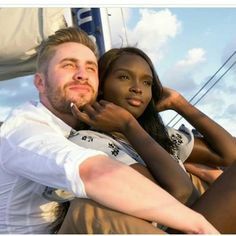 These two never once got hung up on the fact that they aren’t the same race ad show just how normal and cute an interracial relationship can be in reality. The second great interracial relationship is between black Captain Ray Holt and his white gay partner Kevin Cozner. Not only are they an interracial couple, they are a homosexual couple as well. The show does a great job of showing how these two love each other just like any other people would love their partners in a relationship. It is also not afraid to address some of the criticism and discrimination the two have faced both due to their racial difference and the fact that they are gay.